TORONTO, Jan. 17, 2019 /CNW/ - Barkerville Gold Mines Ltd. (TSXV: BGM) (the "Company" or "Barkerville") is pleased to provide all stakeholders with a year-end update on all activities pertaining to the Cariboo Gold Project and upcoming catalysts for 2019. In 2018 the Company aggressively explored and delineated resources on the Cariboo Gold Project. The drilling confirmed down dip extensions of mineralized vein corridors to depths of 700 meters and confirmed high grade intercepts within the current resource. The current resource of 1.6 million Au ounces indicated and 2.16 million Au ounces inferred (Technical Report filed on SEDAR June 14, 2018) is calculated to an average depth of 300 meters over a combined strike length of 3.5 kilometers (Table 1 and Figure 1) and includes 50,000 meters of historical drilling and 170,000 meters of new drilling completed up to the end of 2017. A total of 123,000 meters in 442 holes were drilled on the Project in 2018. Of the 2018 drilling, 64,000 meters were drilled on Cow Mountain, 50,000 meters on Shaft Zone, 4,500 meters at Mosquito Creek and 4,800 meters on Grouse Creek Regional target. The 2018 Regional rock and soil sampling and surface geologic mapping extend the current mineralized strike to 16 kilometers (Figure 2). Surface geochemical sampling on the newly acquired Yanks Peak claims returned anomalous samples greater than 50 ppb Au in soil over a 4.5-kilometer trend (Figure 3). Explore true depth potential with 50-meter step outs down dip of high-grade vein corridors at Shaft Zone, Cow Mountain and Mosquito Creek. An updated Resource statement will be available in 2019 and will include all 2018 drill results. The Company is undertaking required economic, environmental and socio-economic studies to initiate permit applications requesting underground development and mining at the Cariboo Gold Project (including, but not limited to the Shaft Zone, Valley Zone and Cow Mountain deposits. 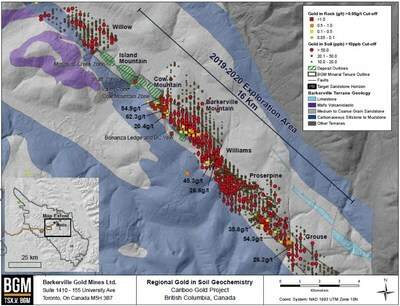 Test mining at Bonanza Ledge was completed in December of 2018 on Barkerville Mountain. Valuable technical information and personnel training was achieved during 2018 that benefits ongoing advanced studies, permitting and future mining. 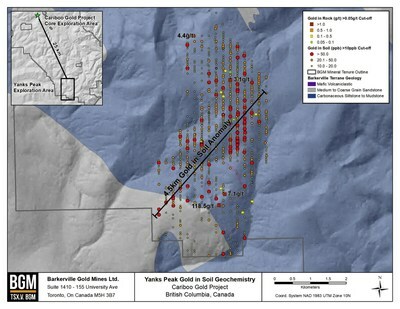 A total of 1,400 meters of development took place at the Bonanza Ledge and BC Vein test mine. Approximately 122,000 tonnes were extracted and processed at a grade of 5.98 g/t Au and 21,125 ounces of gold poured in 2018. The company has also applied for permit amendment to extend the test mining for BC vein ore bodies on Barkerville Mountain. Mining activities at the Cariboo Gold Project are administered on site by the Company's Mine Manager, Paul Ratte. Francois Vezina, ing, P.Eng, MBA, Chief Operating Officer, is the engineer on record for the Company and has prepared, validated and approved the technical and scientific content of this news release.